Steam the pastrami to warm it up and to melt away the fat. Steaming is better than frying because frying will make the meat tough and extremely salty. 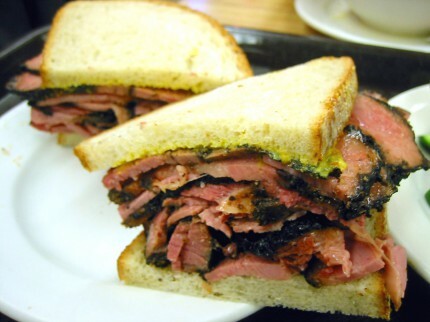 Stack the thin pastrami slices on top of the bread, top with a layer of mustard, then cover with another loaf of bread. Serve the sliced pickles on a separate plate.